The first thirty minutes of FLIGHT is worth the price of admission: a brilliantly shot, unbearably tense sequence in which we see an intoxicated but brilliant pilot somehow arrest the freefall of a shattered airplane by turning it upside down and then gliding it to a semi-safe landing. 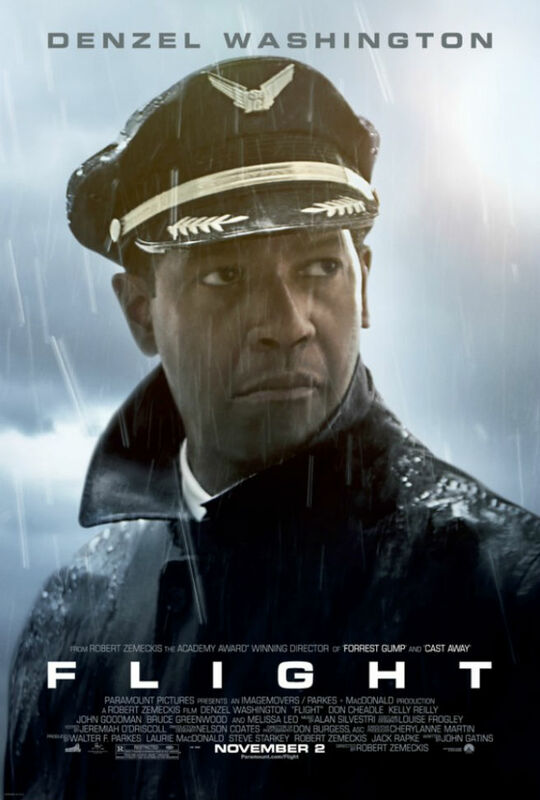 The rest of the movie is about how that pilot comes to turn with his addiction, and the undoubtedly strong performance from Denzel Washington as Captain Whit Whitaker, has its share of Hallmark Card moments and a superfluous ending. As the film opens, Whip wakes up from shagging his stewardess, a fellow addict. He takes cocaine to sharpen himself up from his mammoth hangover, takes a hit of Oxygen, strong coffee and aspirin on the flight to make the take-off, and ten drinks vodka while the plane is cruising. There is no doubt in our mind that he isn't fit to fly, but also that his intoxication is partly what gives him the balls to land the plane safely. This irony is paralleled in the final act of the film in which Whip has to give evidence before the investigating commission, but I won't say more for fear of spoiling the second scene of brilliant tension in the movie. There is no doubt in our mind that it was the plane, rather than the pilot who caused the freefall. The trouble is, neither the airline nor the manufacturer nor the pilots union wants to accept blame and Whip is caught in the middle. He leans heavily on his crew and friends, and helped by a brilliant lawyer (Don Cheadle) to absolve himself of blame and cover up for his drinking. In doing so, Whip is contrasted with Kelly Reilly's Nicole: his love interest who is trying hard to recover. Reilly does well in a largely thankless role. By contrast, James Badge Dale steals the show in a brief scene as a dying cancer patient, and John Goodman is good value in the complex cameo of the drug dealer who is at once funny and repellent. When FLIGHT is good, it's very good. No doubt, Robert Zemeckis' experience in CGI (POLAR EXPRESS, A CHRISTMAS CAROL) contributes to the technical perfection of the opening plane crash sequence. But the final act of the movie also betrays a schmaltzy Christmas Special vibe that undercuts much of the early grittiness. If the movie only had the the discipline to end at Whip's moment of clarity, this would've been a film more worthy of Denzel Washington's performance. FLIGHT was released in 2012 in the USA, Canada, Kuwait, Russia and Turkey. It is currently on release in Israel, Portugal, Germany, Hungary, Italy, Lithuania, Norway, Spain, Sweden, Belgium, Australia, the Netherlands, Ireland, Mexico, the UK, New Zealand, Argentina, Chile, Brazil and Finland. It opens on February 13th in France; on February 21st in Croatia, the Czech Republic, Hong Kong, Singapore, Bulgaria, Poland, Romania and Taiwan; on March 1st in Japan and on March 14th in Serbia. FLIGHT is rated R in the USA and has a running time of 138 minutes.